Plants are at the beginning of the food chain, manufacturing the leaves, roots, flowers and seeds that feed the insects and animals that feed larger animals. For example, the California pipevine with its curiously sculpted flowers grows along our creeks and is the only food plant for the black-and-red pipevine swallowtail caterpillar, that in due course becomes the handsome black and iridescent blue butterfly seen in April. Leaves that fall into the creek and decay become food for insect larvae that feed steelhead. Non-native plants typically do not support a wide range of insect life, and while the presence of most non-native species is inconsequential, some crowd out or otherwise prevent native species from growing or propagating themselves. English ivy, for example, shades seedlings of other species and so prevents photosynthesis; acacias contribute chemicals to the soil that hinder the growth of other plants; French broom adds nitrogen to the soil, thus changing the nutritional balance in favor of non-native grasses. In the small sloughs of the Corte Madera Creek estuary, a non-native cordgrass colonizes mud flats and so tends to reduce the area of mudflats available for the life forms that depend upon them. All plants in their native lands are limited in their ability to spread by natural controls-such as insects and competition-but when they arrive in a new ecosystem, a few of them just go wild, literally and figuratively. The majority of the invasive plants of our creeks originated in gardens as ornamentals. The most troublesome of these are: acacia; bamboo; periwinkle (Vinca); Cape ivy; cotoneaster; English ivy; French broom; giant reed (Arundo; hawthorn; pampas grass; and privet. Others were introduced as food plants, including: blackberry; fennel; fig; mints; onion lily; and cherry plum. Others were introduced as food plants, including: blackberry; fennel; fig; mints; onion lily; and cherry plum. Harding grass, which grows in robust clumps with flower heads reaching 6 feet high, was introduced from the Mediterranean region for cattle fodder. At least two of the three non-native cordgrasses found in our salt marshes were misguidedly introduced to the Pacific coast for salt marsh restoration projects, and have since become widespread. A major aspect of habitat restoration projects is the removal of these invasive species, and eradication in a small area can take years while seeds stored in the ground postpone germination and then awaken to become a young plant. In some cases the removal of invasive species results in the natural return of native species. Along our creeks, alder, ash, bay, oaks, sedges, horsetail and beeplant will often return if the conditions are favorable, but in general, the stock of native plants is so diminished that active revegetation is necessary. 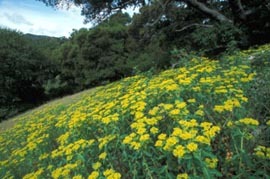 Friends urges residents to participate in invasive plant eradication efforts organized by the Marin County Open Space District, the Marin Municipal Water District and other groups, as well as by Friends of Corte Madera Creek Watershed, and to control or eradicate them on your own property. When selecting plants at the nursery, please consider whether your choices have a tendency to spread beyond your fence.